I was recently very pleased to find out that we finally have a distributor for Salming running shoes in Singapore. I currently own two other pairs of Salming shoes, the Distance 2, and Distance 5, and had to get both of those overseas as they were not available locally. The Salming Enroute is not a new release. It's been around for about a year already, but I never got round to trying it because it's quite expensive to import from overseas. A little background for people who are not familiar with the Salming brand. First, it's a Swedish brand. They have been around for a while but they started out in racket sports making Squash shoes, and only moved seriously into the running shoe market in the past couple of years. In our holistic view on running – Full Body Running with its hub and five spokes is the foundation when we build running shoes. The design and construction of our shoes can be derived from the natural running technique and the biomechanical laws that govern how the human movement when running, this is the last piece in the jigsaw-puzzle to make the "Salming Running wheel" roll as friction-less and balanced as possible. Natural running shoes should be designed to facilitate for you to find the right running technique/form. At Salming, we apply what we call the "Rule of 5"
#1 LIGHT: Improves running efficiency with approximately 2-3% per 100 g reduction in shoe weight. Lightweight shoes will cut minutes away from your PB on a half marathon. #2 FLEXIBLE: Flexibility should imitate the foot flexibility in order to facilitate a natural running technique. You will improve training of biological structures with a flexible forefoot shoe design. #3 FLAT: Low Heel to Toe Drop facilitates correct foot landing at the ball of the foot. In addition you become more naturally balanced with gravity without adjusting body position. The arch area of the shoe should not be pushed up too much as it prevents the arch’s natural cushioning and spring function. #4 THIN: Improves sensory feedback from feet to brain. The foot automatically senses information from the ground contact with each and every step. With this data, your brain responds accordingly. If the midsole is too thick the sensory feedback gets distorted – it would be equivalent to put ski gloves on the hands when typing on a keyboard. #5 COMFORTABLE ANATOMIC FIT: A relatively roomy toe box is preferable so the toes are not pinched together. A tight toe box will deform the foot over time and lead to all sorts of problems. We want the foot to be able to function exactly as nature intended it too. What differentiates Salming from the other brands? One of the key differences is in their TGS 62/75° design. Simply put, the rear 62% is given added stability through the use of a torsion efficiency unit, similar to those plastic midfoot shanks seen in certain ASICS or Adidas shoes. 75° stands for the "Ballet Line" which is a diagonal line that lines up roughly with the locations of the metatarso-phalangeal joints of the foot so provide added flexibility where it is needed through the forefoot for a more natural transition. I will go into this a bit more later on. The upper on the Enroute uses a 3-layer construct. It is essentially two thin layers of mesh sandwiching the Salming Exoskeleton network. The exoskeleton is similar to efforts by other brands to provide support and lock-down to the midfoot, e.g. Nike Flymesh, Saucony ISO Fit. In my opinion Salming's Exoskeleton looks and feels most like the midfoot support system seen in the Nike Zoom Speed Rival. In other words, it works just fine. Despite the multi-layered construct, the mesh materials used are very thin and breathable. 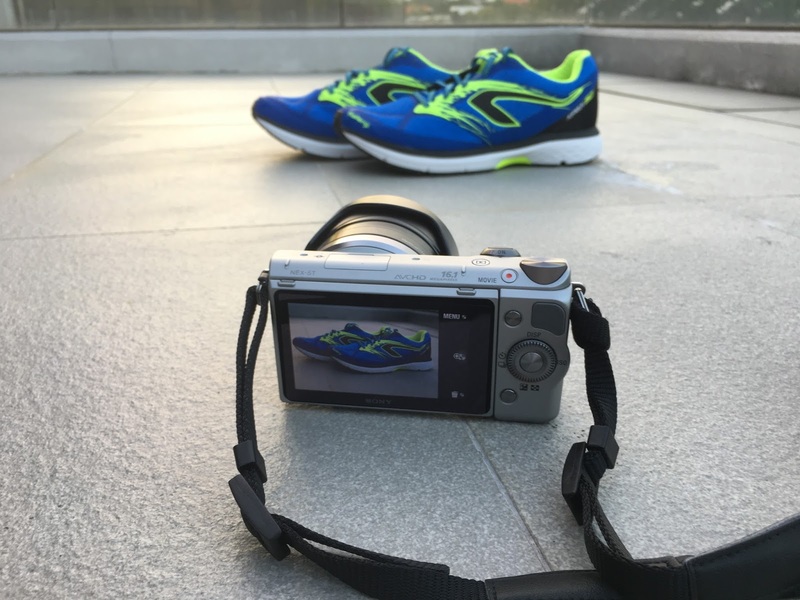 They work very well in Singapore's humid conditions, and even when running through puddles of water, the shoe does not feel waterlogged at all. The lacing system is straightforward and i had no issues getting a comfortable fit in these shoes. The shoes fit true to size, and the overall shoe volume is on the wider side, closer to ASICS than e.g. Adidas/Nike. One issue i had with the Salming Distance shoes was that the toe boxes were pretty low. With the Enroute, the use of a more rigid material for the external toe bumper, as opposed to the softer suede toe bumper seen on the Distance, has allowed for a much roomier and more comfortable fit in the toebox. The shoe is otherwise not overly padded, with the bulk of the padding coming around the ankle collar and the tongue. Overall, the fit and feel is very good for what can be used as an uptempo trainer or daily trainer. The main bulk of the shoe is a single density layer of Salming's Recoil EVA foam, which was first seen in the Salming Miles, a heavy duty mileage trainer, and has now trickled over the the Speed 6 and the Enroute. There is an additional Recoil R foam heel insert that adds more cushioning for heel strikers. I will go a little more into how these foams perform later on. The forefoot uses soft blown rubber to create an extra soft ride, and there are plenty of horizontal flex grooves, all forward of the "Ballet Line". The heel appears to use the more conventional carbon-injected rubber for added durability. The harder carbon rubber also serves to provide a more stable heel landing, taking into account the Recoil R heel insert already makes the heel softer than the rest of the shoe. The forefoot toe spring is fairly modest in this shoe, though you wouldn't notice it much anyway, since the soft foam flattens out any toe-spring quite easily once you step into the shoe. The is a pronounced beveled heel, which does not have any lateral flare. Unfortunately i do not land on that part of the shoe at all so I cannot tell you if it contributes to the ride characteristics of this shoe. When i first stepped into the shoe, I knew I would like it. It felt very soft and bouncy underfoot, just rocking from heel to toe at home. Very shoes feel like this out of the box; in recent memory, only the Vaporfly comes to mind. After the initial bedding in, which for me involves the heel becoming a little less mushy over the first 5km or so, the shoe started to find its groove in the middle miles. While the midsole sports added cushioning in the heel, and the heel does feel mushy walking around, I felt that the forefoot was distinctly softer and transmitted less road vibrations than the heel. Perhaps it is because I tend to land more towards the midfoot in this shoe and am less efficient at landing on the heel. Or perhaps it is due to the use of firmer carbon rubber in the heel which added some harshness to the ride. I know of others who still feel that the Enroute heel could be made firmer for more stability. Those would be the same people who find the Zoom Elite 9 heel to be too soft. I happen to find the Zoom Elite 9 heel to be just right. Before it gets lost in the noise of this review, I wish to say for the record that Recoil foam (as seen in the Enroute) is definitely softer and more forgiving than the RunLite foam used in the Distance models. With the Salming Distance, I felt locked into tempo paces if I wanted to feel good in the shoe, but with the Enroute, the versatility is so much better. It seems to feel best for me at the easy aerobic paces of 4:30-4:40/km (or 7:15-7:30/mi), although it was pleasantly responsive and had a very noticeable forefoot bounce when i did some hard strides in them. The deep forefoot grooves and segmented outsole rubber approach from the Ballet Line definitely make for a nice flexible forefoot and a very smooth transition from landing to toe-off. I've also done some very easy runs in the 5:00/km range and while it feels ok, I did notice that the transition isn't quite as smooth at these slower paces; I tended to want to land more forefoot at this pace, to take advantage of the softer forefoot feel. I have put the Enroute through two hilly long runs so far, and both times they have left me with fresh legs feeling strong at the end. On the second long run, I even threw in an impromptu 5k tempo on the track in the middle, and wound up comfortably doing 95s laps with these shoes, so they definitely can handle the odd 10k/half-marathon/marathon if you want to consider them for longer races. Earlier on, I touched on Salming's TGS 62/75° design, which is their version of a torsion system. Is this something you can feel when you run? My answer is, probably not. Ground contact time (i.e. the time between foot strike and toe-off) is measured in milliseconds, and probably only the most perceptive of runners will be able to discern the presence or absence of any torsion system, especially in this case where the system stops short of the toe joints. Unlike the torsion system in Adidas which is designed to increase the snappiness of the forefoot, Salming's design is meant to add torsional rigidty to the long axis of the shoe, as the foot goes from supination to pronation. Does it work? Probably. Flexible shoes tend to transition slowly. Think of the Nike Free RN series. Those really make you work for your toe-off. Nevertheless, the Enroute somehow transitions very nicely despite being a fairly soft and flexible shoe. A lot of that is probably owed to the added long axis torsional rigidity of the shoe. Durability has been good in this shoe. 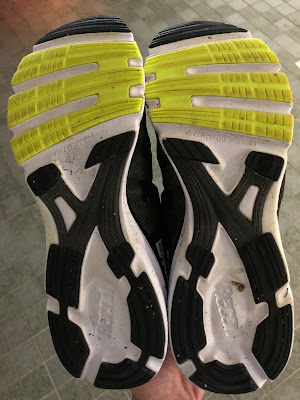 I have over 100km in them so far, and despite the use of soft blown rubber in the forefoot, there is hardly any visible wear on the outsole, and the ride has remained very consistent since the first run. The Salming Enroute is on the softer end of the spectrum as far as shoes in the 8-9oz category go. If you like a firm stable heel, you probably have to look elsewhere. Maybe try the ASICS Noosa FF. However, if you like shoes like the Hoka Clifton for easy runs but find the Clayton just a bit too firm and not bouncy enough, then the Salming Enroute just might fill that sweet spot between the Tracer and the Clifton for you. Think of the Enroute as a Huaka with a bit more heel, and a more tradition transition. This shoe reminds me a lot of the Nike Zoom Elite 9, but with a more muted ground feel, i.e. you feel the ground a little less, and get to experience the bounce of the midsole a little more. I have a big convert to Salming's Recoil foam now, and will try to get a pair of the Salming Speed next, since unlike the Distance series which use RunLite foam, the Speed also uses Recoil foam, and is a full ounce lighter than the Enroute, making it potentially a very good uptempo shoe. If you enjoy the bouncy forefoot feel of the Nike Zoom Streak 6/Zoom Elite 9, but want a little more cushioning for daily runs or longer runs, then this shoe is a very good option to try. Another similar shoe is the Skechers GoMed Razor. The Razor feels lower to the ground and has a firmer ride, but both shoes transition very similarly. Again, if you like doing the fast stuff in the Razor, but want a bit more cushioning for longer stuff, then this shoe would be a good option to try. I really have no complaints with the shoe except that they could perhaps go a little more radical in the aesthetics department. If you have seen their Speed and Race models, you'd know they are certainly capable of challenging the old ASICS NoosaTri for bold colours. -0.2 for somewhat dull aesthetics, when compared to the rest of their lineup. Salming running shoes can now be found at Nazsportsunlimited at 53 Ubi Ave 1, Paya Ubi Industrial Park #02-520 in Singapore. Just discovered your site and good to have a detailed review site w/o an agenda. How would you compare these to something like the Sketchers GoRun Ride 7? Thanks! The Enroute is a firmer shoe with a lower to ground feel than the Ride 7. Overall, the Ride 7 will have a slightly bouncier quality as well. The Enroute has a better upper with a more performance-type fit whereas the Ride 7 upper is less structured and more relaxed. Both are excellent shoes, though i prefer the Ride 7 for long runs, and the Enroute for slightly faster stuff. Hi, thanks for the great review. I use the Ride 7 for long easy runs and the Enroute for speed work and racing from 10k to 21k. Do you have any feedback on the Enroute 2, there is practically no reviews online for the new version? Very Informative blog article around this topic although this is perhaps the second or 3rd time for me that I am here in your blog. Good work is always appreciable. Keep up the good work, dude! I just wanted to say hi and show my thanks for the information provided. Best Reviews Guide analyzes and compares all Kickboxing Shoes of 2018. You can easily compare and choose from the 10 best Shoes for Kickboxing. SEO Expert ServicesYour Brand at the top of Google. I first became aware of Decathlon’s Kalenji shoe line in 2015. At the time people were making comparisons of one of the Kalenji trainers to the popular Brooks Launch v1. However, even though Decathlon opened stores in Singapore some time back, I never got round to visiting them to check out the shoes. Notwithstanding the allusion to Kenya’s world-famous Kalenjin tribe, Decathlon actually has its roots in Europe; they originate from Lille, France back in 1976. They pride themselves on doing things in-house, getting rid of the middlemen, in order to sell their products at remarkably low prices. Indeed, you will notice that the shoes do not even come in cardboard boxes, in a bid to reduce production costs. Disclaimer: I currently own three pairs of Vapor Street, all of them purchased at full retail. The opinions herein are my own. The Nike Vapor Street is Nike’s attempt at a casual lifestyle version of the very exclusive unicorn that is the Nike Zoom Vaporfly Elite. Many in the running community saw it as lifestyle shoe, and hoped (myself included) that interest in the Vapor Street would draw sneakerheads’ attentions away from the Vaporfly 4% and allow real runners to finally get their hands on some 4% magic. The reality is that the 4% is still incredibly hard to come back, and is still being sold at ridiculous prices on the resale market, while the Vapor Street sits on shelves in the likes of Dover Street Market and End Clothing, amid a lukewarm response from shoe collectors. The Japan series of ASICS shoes enjoy the kind of loyal following unheard of among other sports brands, to the extent that everything underfoot (i.e. midsole and outsole) have remained largely unadulterated for over a decade. After all, you don’t fix what isn’t broken. The Japan series shoes are in fact made in Japan; everything from overlays to SpEVA foam production. This is in contrast to their mass market shoes which are mostly made in China. I was very excited to try out these two shoes because they were supposed to have a bouncier and more responsive feel compared to their non-Japan equivalents, i.e. Skysensor Glide and Tartherzeal. The main thing that puts people off is probably the price. The MSRP of the Skysensor is S$399 and that of the Tarther Japan is S$369 a pair. That is exceedingly exorbitant for running shoes, by any stretch of the imagination, though it is rumoured that the retail price might be dropped to a more competitive price point in the near future.